This past Saturday saw what was most likely the most punk rock crowd ever in attendance at UNT’s Murchison Performing Arts Center. The Converse All Star clad group was in attendance to listen to Henry Rollins, former lead singer of Black Flag, longtime activist, and spoken word artist, give his presentation, “The Long March.” The event was part of the UNT’s Fine Arts series 109th year of programming. Other artists this year have included last month’s sound-sculpturist, Nick Cave. In what was an arguably tangential rant, Rollins talked for two and a half hours about topics ranging from US History, his love of Texas, former President George Bush, Costco, touring with Black Flag, Haiti, and his upcoming show with National Geographic. We hesitate to describe anything about Rollins’ speaking as “slow,” but the spittle didn’t really start flying until the topic of Rick Perry came up. Then, in what seemed as if it erupted from one long, never-ending breath, Rollins spoke with reckless abandon about what’s wrong with the world, how he’s tried to fix it and various weird things that have happened to him over time. The vein bulging out of his neck that must have surely been visible from the balcony, gave visual confirmation to what really put a bee in Rollins’ bonnet. The crowd ate it up. Rollins ended the evening by encouraging the mostly-collegiate crowd to do what they could to change the world. 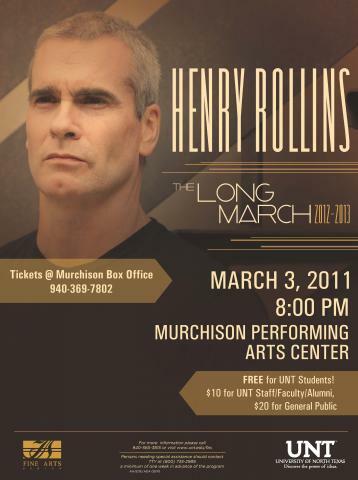 Let’s hope that the UNT Fine Arts Series continues to provide their students, alumni and Dentonites with guests at least half as interesting or as fun as Henry Rollins.